Deep Run is Hillevi Loven’s beautifully crafted and nuanced portrait of out-and-proud, teen trans-man Cole who searches for love while holding tight to his religious faith in his titular (evangelical, blue collar, rural North Carolina) hometown. Exec-produced by Susan Sarandon, the doc ironically made its North Carolina debut at this year’s excitingly eclectic RiverRun International Film Festival in Winston-Salem right as the rest of the nation – from governors to corporations to Bruce Springsteen – began boycotting the state in reaction to the anti-LGBTQ HB2. Hammer to Nail’s Lauren Wissot was fortunate enough to catch up with the thoughtful director post-fest to discuss everything from following evangelical millennials, to upending us urban Yankees’ preconceived notions about our gender-nonconforming neighbors down south. Lauren Wissot/HtN: As a Brooklyn-based filmmaker, how did you even discover Cole and his story? I think I read that you’d set out to do a film about evangelical millennials…? 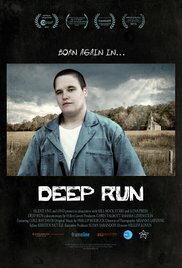 Hillevi Loven: Deep Run is my first feature film, and I ran after my documentary subjects with my camera and a naive idealism; I wanted to find captivating people and let their lives cinematically unfold in front of me. The seed of the film was planted after I spent 2004 working on youth voter mobilization and anti-Bush protest performances. I was devastated by the election results. Disenchanted with the American electorate, I began searching for a documentary subject, and I discovered the youth culture of evangelical millennials. Starting in NJ, I followed a Christian punk boy band on their tour through the south, with the idea that the music scene would provide an entry into the psyche of the influential evangelical millennials. I ended up meeting some amazing folks who had a rock venue/skate park/Christian youth center in their living room in Kinston, NC, and through that circle of rebel underground Christians I was introduced to Cole. And then I simply fell in love with Cole and his story and his spirit. HtN: I caught your film at the RiverRun fest in North Carolina, right on the heels of the state passing heinous anti-LGBTQ legislation. So what’s it been like screening the film in the belly of the beast? It must be a different experience than playing at, say, Outfest LA. HL: This month, I had my first southern screenings in North Carolina and South Carolina. The wave of anti-trans and anti-LGBT legislation in the south and throughout the country is disturbing, but I hope that the film can be especially useful and have an impact right now. Folks in North Carolina are angry and embattled, and energized. I have not gotten a chance to screen with conservative audiences, but I would welcome that opportunity if there might be a chance for dialogue. I talked to an artist at my RiverRun screening who is planning a protest event that involves painting the image of the conservative Governor McCrory on the backs of trans. People are galvanized by the anti-LGBT legislation. Southern audiences have been particularly excited to see representations of rural, trans, working class people. In Columbia, South Carolina we had a full house screening at the Indiegrits festival, with a talkback led by South Carolina trans activist/educator OK Keyes. Keyes had just spent the week protesting the anti-trans bill in South Carolina. The talkback and conversation lasted for an hour. The audience was diverse and included an LGBT youth group. It was an amazing experience to screen for audiences in San Francisco and L.A., but it feels like the screenings have more weight here in the south. There is a different sense of urgency in a battleground state. HtN: You truly capture Cole as an entire human being – not just as a trans man – something that sounds simple but is quite profound. To me (albeit a genderqueer chick) what I found most “other” about Cole is not his gender identity but his rural, blue-collar, southern way of life. He has much more in common with his straight religious neighbors than he does trans folk in cosmopolitan cities such as LGBTQ-friendly NYC or San Francisco. Why was it important for you to explore this non-Transparent, so to speak, side of the transgender world? HL: I have always been interested in how people deemed to be outsiders negotiate their lives in challenging environments. I am a born and bred New Yorker, a straight girl-ally who went to a progressive Episcopalian grammar school not far from the Stonewall Inn. I reluctantly traveled down to the south with my own set of prejudices. As I was filming and doing research in the south, the people I met and the conversations I engaged in took me by surprise, I encountered so many seeming contradictions and so many more political shades of grey. As I developed a working relationship with Cole, it became important to me to get at some of the complexities of American millennial identity. I wanted to make a film that would challenge the thinking of progressive and LGBT audiences, and also challenge the perceptions of people of faith. First and foremost, I was drawn to Cole in order to create a portrait of Cole. It was always about Cole – the entire human being – and that is more than a trans story. HtN: When I was growing up in the 80s in small town Colorado anyone who didn’t identify with the norm simply fled to a coast (including myself). So as I told Cole when I met him, he should take pride in his refusal to be pushed out of his hometown by homo and trans phobic bigots. Standing his ground, showing he has just as much right to live in Deep Run as the straightest cisgender resident does, is an act of resistance. (Whereas ghettoizing oneself in big cities is actually the easier way out.) As a New Yorker yourself were you conscious of this (or the generational shift) during filming? HL: I am interested in the way that peoples’ everyday lives can translate into acts of resistance. In 2008, when I first met Cole, he was 17 and identifying publicly as a lesbian. Cole was one of the first kids to come out in his high school, and was a gutsy vocal presence there. With a group of friends, he founded the first unsanctioned, rogue GSA in the school, and organized protests against discriminatory treatment of LGBT students. For my generation in the 80’s, if I had lived in a remote rural area, I would not have had access to the language or the cultural spaces that Cole’s generation has access to online and offline. That said, it is crucial to pay attention to the fact that rural youth interacting with movements like the “It Gets Better” campaign can have very different support systems in place compared with urban youth. One of the qualities that I was struck by when I met Cole was his strong conviction that he was a child of God, he himself was sacred and one with God, despite the fact that he was surrounded by an evangelical community that denied his right to exist. A defining characteristic of the millennial generation is the access to online communities that give them a wide assortment of frameworks to think and live by. I was very conscious that the very act of remaining in his rural evangelical hometown, rather than moving to an urban center, was an act of resistance. Waking up in the morning, heading into town and being out and visible was a daily act of resistance in the trenches of the culture wars. He endured violent attacks and threats because of who he is. My initial research for the film involved an investigation into larger movements of cultural and political change in rural areas, and Cole’s story embodied a microcosm of these shifts. HL: Producer Chris Talbott worked on Dead Man Walking and Cradle Will Rock with Tim Robbins. That period marked the beginning of a long friendship and working relationship with Susan Sarandon. Susan loves documentary film, and throughout her life she has championed those who challenge gender norms, so she was a natural fit for this project. The movie would not have been the same, would not have been finished without her.